« Where is Leon Cooperman investing $6 billion? The Reuters Jefferies CRB Index is down 8% so far in May with almost every single commodity in the index registering red. Even the ongoing geopolitical tension in the Middle East and North Africa has not been able to shield the ever bullish crude oil from the commodity rout. Both Nymex WTI and ICE Brent suffered heavy losses. 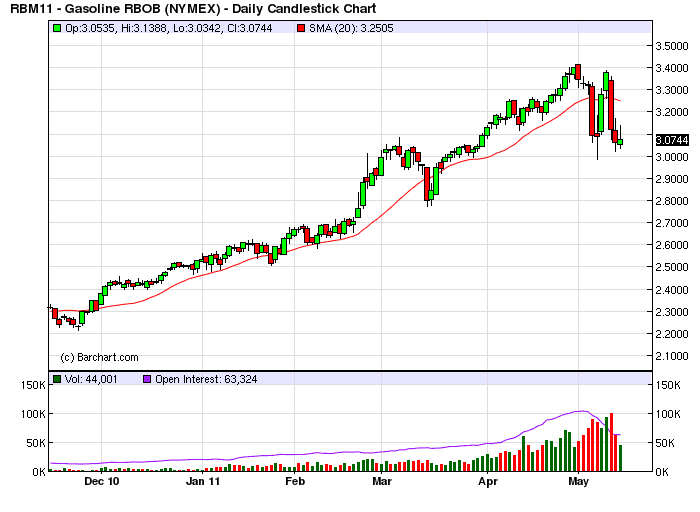 In the two weeks ending Friday, May 13, Brent dropped about 10% to close at $113.83 a barrel on ICE, while WTI plunged 12% to $99.65 a barrel at Nymex, and RBOB gasolne futures for June also lost 8% to around $3.0766 a gallon. Although this week started off with some sign of stabilization, the heavy selling and volatility resumed mid week. The deep slide for commodities, including crude and gasoline, could be partly attributed to the reverberation from a recent wave of margin requirement increases amid volatility and price run-up in commodities. CME Group already raised margin requirements on several energy products, and announced a second hike for gasoline futures effective Thursday, May 12. Increased margin requirement could trigger liquidation contagion as traders may need to sell their profitable positions in other commodities or equities to raise cash in order to meet the new limits. Crude oil weakness also came from some bearish reports that hit the market this week. EIA data showed that gasoline inventories had its first weekly increase (1.3 million barrels) in about three months, while crude oil stockpiles continued to build. The IEA (International Energy Agency), citing “$4/gallon gasoline is likely to yield an anemic US driving season,” also said the oil demand in North America would fall by 194,000 barrels per day in 2011, a downward revision by 220,000 b/d. The price tumble was big enough to trigger a five-minute halt in trading of crude oil, heating oil and gasoline for the first time in over two years on Wednesday. May 11 at CME electronic trading platform. .
With the record retreat in crude oil prices, many consumers are expecting ‘some big retail price drops’ in time for Memorial Day weekend. After all, crude oil accounts for more than two thirds (68.3%) of the price in a gallon of gasoline as of March 2011, according to the U.S. Energy Department. Crude oil and gasoline prices typically trend in tandem on the same set of market fundamentals, but this time around, the decoupling of gasoline and crude oil would mean gasoline prices may be harder to drop. MarketWatch reported that some refiners said their fuel sales in April had fallen by as much as 4% from March as high prices prompted consumers driving less. As refiners cut their run rate due to lower gasoline demand, the resulted sliding refinery utilization rate–82.8% as of April 29 as compared with 89.6% same period a year ago–has created a diverging supply side fundamental between crude oil and gasoline, which is more bullish for gasoline, and bearish for crude oil. That is, while crude oil stockpiles continue to build pressuring WTI, gasoline inventories and are now 21.4 million barrels lower than a year ago and could dip below the normal range before the start of the summer driving season (see chart below). Days of gasoline supply also dropped to 22.9 days vs. 24.1 days from a year ago. Another factor holding up gasoline prices is the flooding of Mississippi River. Rising water levels and heavy rains are causing fuel transportation disruptions in tankers, barges and pipeline closures, which reportedly has already contributed to higher pump prices in certain parts of the Southeast and Midwest regions. About 14% of total U.S. refining capacity is located in regions affected by the rising Mississippi River. Concern about disruptions of fuel helped boost wholesale gasoline prices. Moreover, pump prices typically react a lot faster to spikes than to declines in oil prices. In a guest post at EconMatters, Bob van der Valk, a petroleum industry analyst, estimates the lower oil price may not show up at the pump for up to eight weeks vs. within the first two weeks in the case of oil price spikes. According to AAA Daily Fuel Gauge Report updated through May 13, 2011, the national average price stood at $3.982, essentially unchanged from a week ago, while 16 states have average gas price of more than $4 a gallon. EIA projected that gasoline demand is likely to increase by just 0.2% in the peak summer driving season this year. However, with Memorial weekend, the traditional kickoff of the summer driving season, just two weeks away, and as the current gasoline stocks are very low by historical standard, plus Mississippi River flooding further complicating the picture, consumers may not see a real relief at the pump till the end of summer driving season in September, assuming no huge price spikes coming form crude oil. 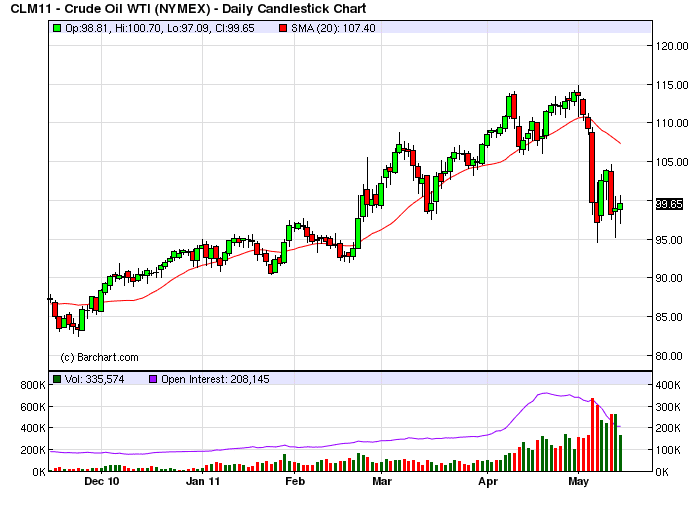 Looking ahead, crude oil price may be hinged upon gasoline for the remainder of this year. That is, WTI prices may get support if there are continued draws on the gasoline inventory signaling stronger fuel demand. In the next 3 months or so, some drawdowns of crude inventories could be expected as refiners increase run rate to replenish the low gasoline inventory amid peak demand season, which should provide support to crude oil price as well. Nevertheless, some factors as outlined below would bring continued downward price pressure for both WTI crude oil and RBOB gasoline, particularly in the second half of this year, barring geopolitical and hurricane events. Some big players still holding long positions in anticipation of higher oil prices, which would trigger huge price plunge and volatility should they decide to liquidate. Compared with crude oil, RBOB gasoline looks overpriced thus more vulnerable to larger percentage falls. For now, both crude oil and gasoline are momentum driven. From a technical perspective, most of the indicators are bearish for both commodities as the six-month long uptrend has been broken (See Charts Above). If WTI breaks below the $95 support levels, it could drop to around $90 or even below. For RBOB gasoline, the $3.00 support should hold through August, but after the driving season ends, and if it breaks $3.00 a gallon, the next support level would be around $2.80 levels. Source: Dian Chu, EconMatters, May 14, 2011.